Research for my recent post about Rudolph Dunbar, the Berlin Philharmonic's black conductor, uncovered the surprising fact that the Berlin orchestra was first conducted by a woman in 1887 and that she was English. Below is a profile of Mary Wurm from the Berlin Philharmonic's website. It is a pleasure to be proved wrong in such auspicious circumstances: so this post corrects my 2007 article about the still eminently praiseworthy Antonia Brico, who was wrongly identified as the Berlin Philharmonic's first woman conductor. Mary Wurm studied piano with Clara Schumann and composition with Charles Villiers Stanford; a listing of her compositions is available via this link. 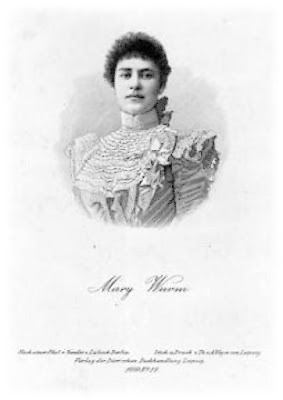 Mary Wurm – Pianist, Composer, ConductorThe first woman on the podium of the orchestra was Mary Wurm from England, who conducted a concert by the Philharmoniker at the Berlin Sing-Akademie 130 years ago, on 5 November 1887. At the age of 27, the student of Clara Schumann already enjoyed enormous success as a pianist through Europe. But she had talent not only as a pianist, but also as a composer and conductor. And she wanted demonstrate these skills, too. In her concert with the Philharmoniker, she exclusively presented her own works: a piano concerto, a concert overture, plus songs and pieces for solo piano. 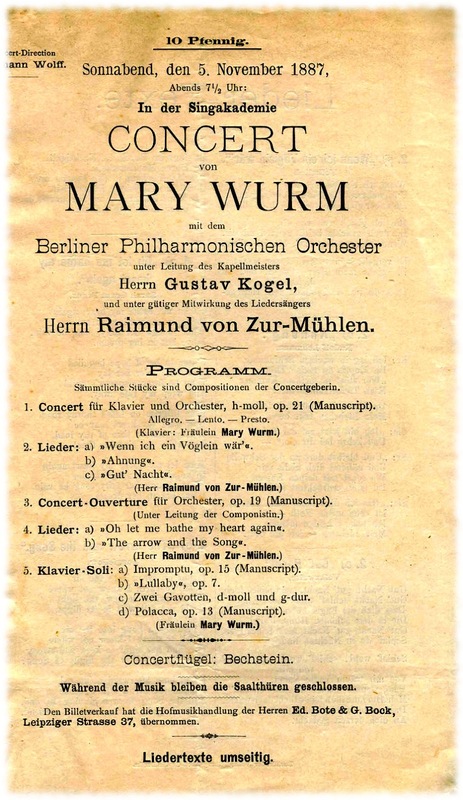 As the programme leaflet above shows, Mary Wurm only conducted the overture. For the piano concerto, she took on the role of the soloist, while the orchestra was directed by Gustav Kogel. And one more thing the programme leaflet reveals: Mary Wurm is mentioned as the “concert organiser”, which means that she hired the Berliner Philharmoniker to present her works to the public. At the time, such so-called “soloist concerts” formed an important source of income for the orchestra.